Make your nephew birthday wishes matter as much as your nephew does to you. Here, you have so many wonderfully written, one-of-a-kind birthday messages for nephews to choose. All you need to do is select the birthday greeting that's best for you..and right for him. How? 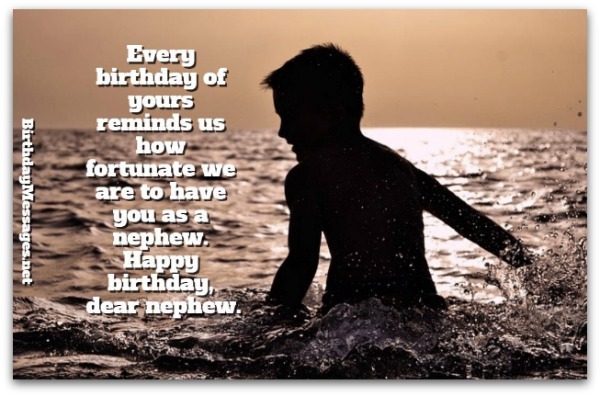 Stick to this simple rule of thumb: selecting the right nephew birthday greetings comes down to your feelings for him. That's basically all you need to do. Happy birthday, nephew. It's an incredible privilege for me to celebrate your special day with you. Happy birthday. Wishing you all the best that life has in store for you. May you enjoy years upon years of happiness and health. Happy birthday. Dear nephew, may you only know wonder, health, prosperity and joy, starting with this birthday. Happy birthday to a nephew who breaks the "nephew" mold every day. May you live to experience decade after decade of happiness. Happy birthday. May this birthday be the one to remember always, for you and all the people who know and love you. Happy birthday. Hope this birthday is the best you'll ever celebrate. Happy birthday. May you enjoy a truly special day today. May you forever appreciate the gift of life bestowed upon you. Happy birthday. You're truly a blessing to us and, as you commemorate your birthday, know that we only wish you health and happiness today and all your tomorrows. Happy birthday. We're incredibly grateful to have you as our nephew. Happy birthday. You don't have to be the coolest aunt or uncle alive for your nephew to love you, but picking the wrong nephew birthday wishes won't win you any points with him. Sending your nephew standard (in other words, generic) birthday wishes is okay, but I don't recommend it. Sure, this is the easiest path to take (and it's a nice way to show how much you care), but you can do so much better — and your nephew likely deserves much better. 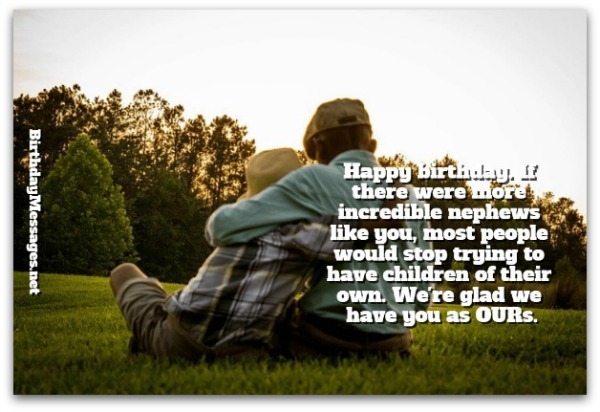 To make it simpler for you to pick perfect nephew birthday messages, I've supplied you with many birthday greeting styles to choose from, so you can select the one (or two or three or four...) that's right for him. Athletic nephew: Pick an inspirational birthday wish. Mature nephew: Choose a cute, clever or cool birthday greeting. Cool nephew : Select a clever or cool birthday message. Artistic nephew : Opt for an inspirational, funny, cool or clever birthday verse. Infantile (or young) nephew : Go for a cute, sentimental or happy birthday wish. The helpful hints above are exactly that — just hints. Since you know your nephew better than me, let your intuition guide you to the right nephew birthday wishes. 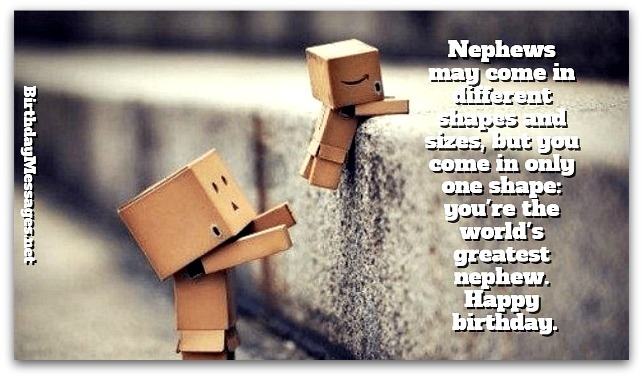 Combine different types of birthday messages to give birth to the best nephew birthday wishes for him. Of course, if you've stumbled upon nephew birthday messages that fit your nephew, don't change anything (keep them "as is"). You have a whole world of possibilities, with over 50 to choose from on this page. You're loved, treasured and respected — today and always. Happy birthday. As you celebrate your birthday, we're working our magic to make sure your life is full of blessings. Happy birthday. For us, today is the most special day of the year because it's your birthday — and you are one of the most special people in our lives. Happy birthday. Happy birthday. As you celebrate your birthday, here's a special prayer for you: may the Big Guy upstairs give you a life full of wonder, joy and the wisdom to appreciate it every moment of the day. You matter so much to us, more than you know and more every day. Happy birthday. Happy birthday. You're a wonderful nephew who deserves only the best things in life — on your special day and forever. We are here to nurture and love you every day and twice as much on your special day — and don't ever forget it. May only great things happen to you. Happy birthday. Once again, your birthday here. Once again, we get the chance to wish you only the best of the best. Once again, it's our pleasure. Happy birthday. For me, today is the perfect time to celebrate you. Let's start celebrating now! Happy birthday. Year after year we rejoice as we get to celebrate you dearest Nephew. Happy birthday. May love, joy and wonder fill your life today and for all time. Dearest nephew, we feel blessed to have you in our lives. May your life always be just as blessed. Happy birthday. Happy birthday. May you be granted an abundance of joy, wonder and strength. Celebrate today and for years to come, blessed with great joy. Happy birthday. Wishing you immense happiness and a long life. Happy birthday. Have a wonderful birthday, as wonderful as you are every day of the year. Happy birthday. Always know that you're incredibly loved and cherished by all who know you, especially me. You have enriched our lives so much that it's impossible to put it into words. We love you. Keep on being you. Happy birthday. Happy birthday to the world's most amazing nephew. Happy birthday. You've brought so much joy into my life. I wish you more joy than you can handle — and then some — the rest of your life. Each one of your special days reminds me just how fortunate I am to have you in my life. Happy birthday. Happy birthday. You're a wonderful nephew, the sun of our family, a light that shines so bright it fills every room you enter. Enjoy your special day. As my incredibly wonderful nephew, you deserve an incredibly wonderful birthday…and, even more so, an incredibly wonderful life. Let’s get started with your birthday celebration, dearest nephew. It's going to be one to remember always. Have the best birthday ever! Hey, incredible nephew, I wish you an incredible day. Have an incredible birthday. 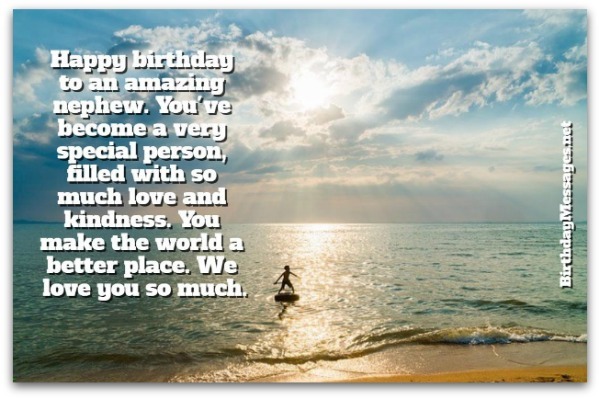 Have an amazing birthday, full of all the things you enjoy most in life! Enjoy it my nephew. Happy birthday, my dear, dear nephew! Your uncle and I love you so much and hope your life is as full of love as our hearts are for you. You're as bright as the brightest star in the sky, as magnificent as the deep blue sea, even as wonderful as a sunrise and sunset. Happy birthday. Happy birthday. As our nephew, you’ve been a complete joy. May you only know 100% joy the rest of your life. Happy birthday. You’ve come a long way, from a tiny tot to magnificent man. Your parents should be very proud of everything you have accomplished in life. We are. There’s so much we, your aunt and uncle, can say about you (all good, of course). One thing, though, sticks out for us: you are the #1 nephew in this world and our world. Happy birthday. You’ve always been an important part of our life. We appreciate that you’ve let us be an important part of yours. We love you. Happy birthday. When you came into our life, you changed everything. You made us kids at heart, filling up our life with fun and games. Now that you’re older, you continue to make us feel alive with joy. Happy birthday. You’re our favorite nephew...and that’s not just because you’re our only nephew. It’s because you’re great. Period. Happy birthday. As far as birthdays go, yours is one of the most important in our lives. To mark the occasion, we’ve made your special day a statutory holiday: Nephew’s Day. Now let’s celebrate it in style. I never knew that nephews could be just as adorable and sweet as nieces. You are the most adorable and sweet nephew on this planet. Happy birthday. Whenever we are with you, our hearts fill up with love and joy. That’s how wonderful you are, dear nephew. Happy birthday. When we heard you were on the way, we couldn’t be more excited. When you arrived, our hearts grew by leaps and bounds. Your birthday is the day we became the luckiest aunt and uncle alive. Happy birthday! It seems like only yesterday you were in diapers, waking up all hours of the night. Now you're older, wiser and, thankfully, toilet trained. You may be my nephew but I love you like you were my own son. You are as caring, generous and nurturing as any son would be. Happy birthday, dearest nephew. Happy birthday. You are a blessing to us and all who know you. I love you, sweet nephew. Your birthday is the best day of the year! I really hope it's the best one for you, too. Have a truly special day. Happy birthday. Wishing you a long, rich life — financially, spiritually and, most of all, emotionally. Happy birthday, my favorite nephew. With all the nuts on our family tree, it's good to know you're on my side! Dude, your birthday is sick! I’m not quite certain what I actually wrote there, but I figured you might. Happy birthday. The best gift for the world's best nephew could only be one thing (drum roll, please): us, your best uncle and aunt at your birthday celebration. Happy birthday. Happy birthday to my nephew, my protege, my friend, my favorite. You're sweeter and kinder than I ever thought a nephew could be. It's a good thing you're mine. Love you. Happy birthday. For you, nephew, anything, as long as it costs under $6. Hope you like this birthday card. Happy birthday. I never thought I would have a nephew as nice, good-looking, bighearted and bright as you. Then, I remembered you take after me in the gene department, so no real surprise there. Happy birthday! If someone had told me that I could love you, my sweet nephew, as much as I love my best friends and my own children, I would have thought they were crazy…until you came into this world. You're one of my top favorites. Happy birthday. How to win over your nephew! 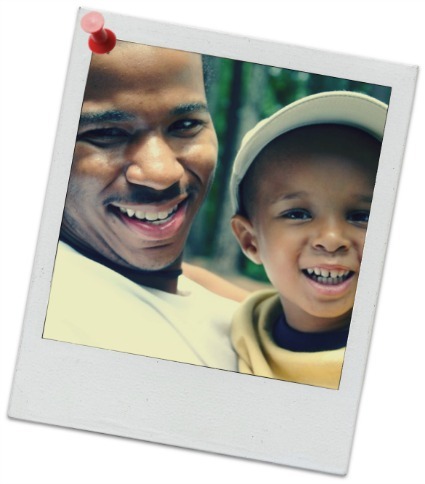 As an aunt and uncle, you play a major role in the lives of your nephews, whether or not you have children of your own. Every year, on your nephew's birthday, you have an opportunity to express exactly how you feel about him. That's where the nephew birthday wishes on this page come in. 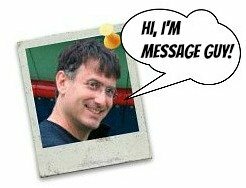 If you would like to add more to the nephew birthday messages I have here, do not hesitate even for a second to check out the article, "10 Ways to Bond With Your Niece or Nephew," on flintobox.com. It's packed with ideas!